V-457 is a Harley previously presented on this blog. The owner working as a teacher did carry his pupils in the previous pic. In this pic with a friend in the sidecar, both guys seems to be dressed for some special occasion? There is one strange detail with this bike, there is the original HD acetylene headlamp with an electrical lamp added to the side. One can just wonder where the generator might be added if this is a magneto model. 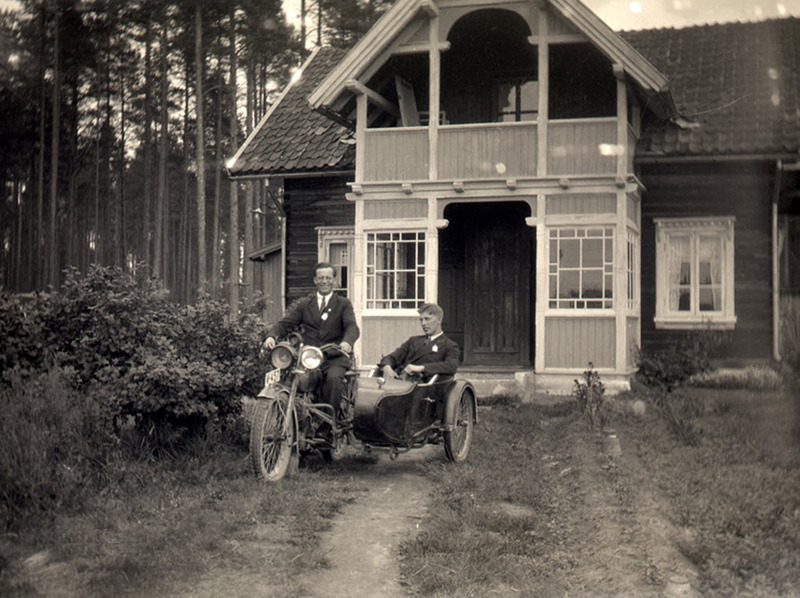 Everytime I visit your blog I get awestruck with those fantastic pictures, and especially pleased when many of the captures are from scandinavia, I think it is an area that isnt covered very much in litterature or transport history. I can just say WOW! Hi Charlie, thanks for nice words. I agree fully with what you say regarding litterature from my region on the fact that motorcycles where suchan important part of early motoring. If there just was time and money I have since long realised there is enoughmaterial to make such a book.